WASILLA — A West High hockey player took physical action against two on-ice officials after being ejected from Thursday’s first game of the ASAA First National Cup the state hockey tournament at the Menard Sports Center. 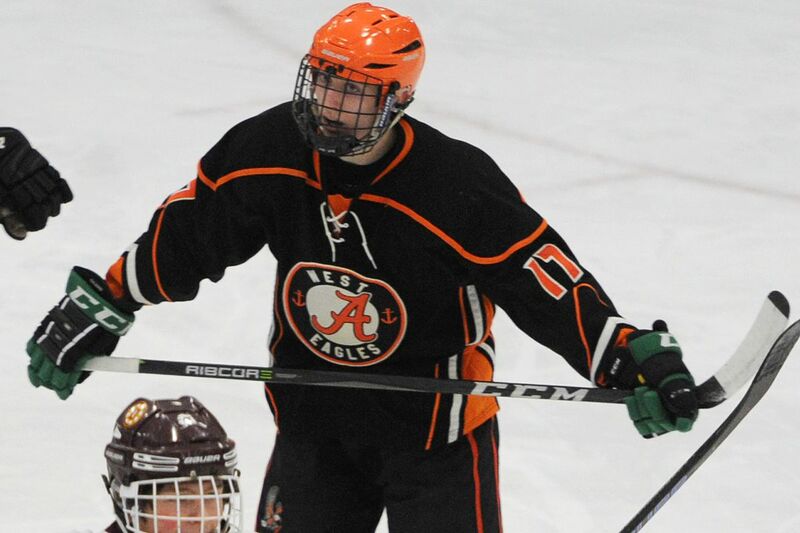 Sawyer Courrier, a senior forward, is likely to never play another high school hockey game. The ejection comes with an automatic game disqualification for Friday’s game, and the Alaska School Activities Association also suspended him from Saturday’s game, in the event the Eagles advance that far. Saturday marks the end of the high school hockey season. ASAA could also decide to fine West High, said Rus Schreckenghost, ASAA’s associate executive director. Whether there is a fine, and if so how much it would be, is up to ASAA executive director Billy Strickland, who wasn’t at the game, Schreckenghost said. West High has 24 hours to appeal any actions taken against it or the player, he added. The Eagles, who lost 3-2 to Dimond, will be allowed to keep playing in the tournament, Schreckenghost said. West High principal Sven Gustafson confirmed by email that the Eagles will play in Friday afternoon’s consolation round against the Colony Knights. The incident began when Courrier was called for a two-minute minor for holding midway through the second period. West trailed 2-1 at the time. Courrier began to show his disagreement with the call while heading toward the penalty box, which led to his ejection. When Courrier discovered he had been disqualified, he skated away from the penalty box, pushing a teammate and a linesman out of the way in the process. Before reaching the bench, Courrier extended a two-arm shove and slash to the shoulder with his stick to Dimond’s Jack Dolan, who was on the ice. When referee Stan George stepped in to defuse the situation, Courrier made contact with an elbow to George’s head before George took him down to the ice. Two more linesmen rushed to the scrum, one of whom took away Courrier’s stick. Courrier was escorted off the ice and went to the West locker room, followed by a member of the West coaching staff. The game was delayed nearly nine minutes as officials and coaches sorted out the situation. The police were not contacted, he added. “ASAA and Wasilla High School (the tournament host) and the Menard Center, we did not go in that direction,” he said. “I can’t tell you what the Dimond parents might want to do. George declined to comment after the game. Dimond coach Dennis Sorenson spoke about the game, but wouldn’t talk about the ejection and what followed. West coaches and players couldn’t be found for comment. West activities principal Ja Dorris said any action West may take against Courrier will be decided after the school receives reports from ASAA and the on-ice officials. He didn’t know if the Anchorage School District will get involved; a message left for an ASD spokeswoman was not immediately returned Thursday. Neither Dorris nor Schreckenghost could think of another time when a player took physical action against an official during a game. “It’s definitely not the norm,” Dorris said. “They’re kids and some cool was lost, obviously, but it doesn’t happen often, that’s for sure. Courrier, who made the all-state tournament team last year, ultimately received the initial minor penalty, two five-minute majors for game misconduct and high sticking, a 10-minute misconduct and a game disqualification. The West bench received a two-minute minor for unsportsmanlike conduct, for a total of 14 penalty minutes that stretched over two periods of play. “Certainly we have ejections in hockey, but not this type,” Schreckenghost said. He said the incident marred what was otherwise a good hockey game. Sports editor Beth Bragg contributed to this report.